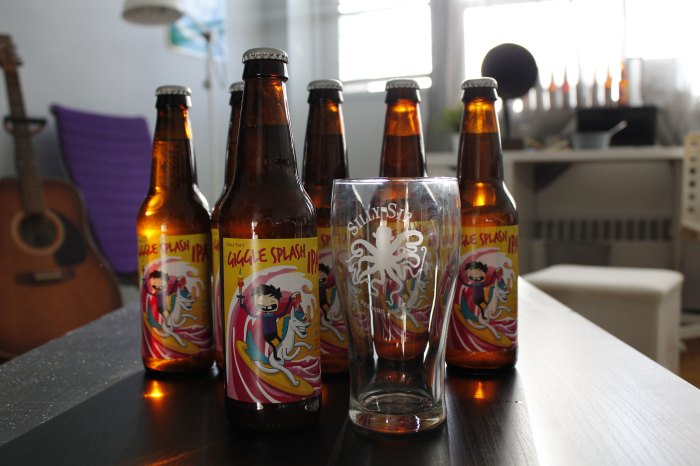 Silly Sir Brewing Co.Introducing: Giggle Splash IPA - Silly Sir Brewing Co. The recipe comes from Eric Brews and was originally brewed for his wedding. Eric Cousineau is a highly experienced and technical homebrewer who helms the GTA Brews Homebrew Club of which I am a member. As such, I knew this recipe would be tops blooby, so I decided to give it a shot. "...it's light. It's refreshing, it causes giggles. Splash is associated with citrus all the time (juices, soda)... consumers care about how it makes them feel..."
... and that's why I keep Ethan close to my heart. He articulates so perfectly what I know to be true instinctively and encourages he my insanity. As always, my indulgent girlfriend Sara designed and executed the labels. I told her I wanted it to be extremely bright, cartoonish, and ridiculous. 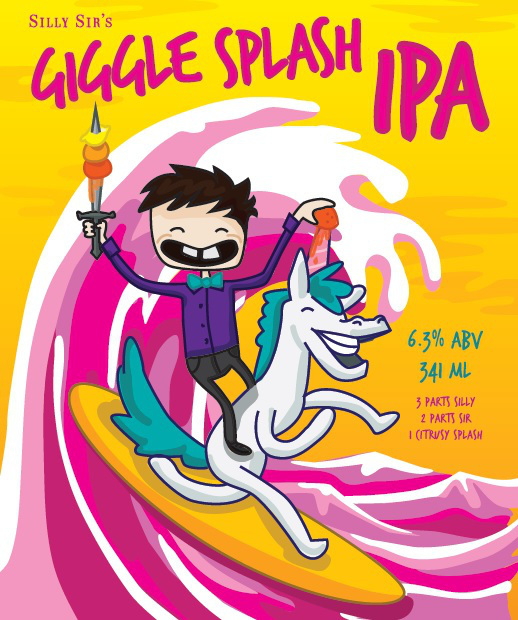 The labels were designed to emphasize the citrusiness of the beer by featuring a cartoon version of myself riding a unicorn and jucing an orange on the giggling unicorn's horn. It perfectly captures the existential silliness and fun of the Silly Sir brand. I'm really quite proud of this beer. My brew club buddies enjoyed it, and I've gotten lots of positive feedback from friends and family. I'm always thinking of ways to improve my beers so I already have plans on how I could do things a little differently so as to extract even more juicy aromas from the hops. I've been home brewing for about a year, and while I've learned a great deal know I'm only just skimming the surface of what great beer can be. You are so articulate. Am going to try your beer tonight. Will give a review later.